In theory, it should be easier and more compelling to review putters and drivers than irons -- we use the putter for about 30% (or more) of our total shots per round, and the driver for another 15% (though probably on at least 75% of the total holes) -- but there is nothing more fun than reviewing a sparkling new set of irons. There is just something about the potential of all those good shots just waiting to happen that makes this such a fun task. With the Bridgestone Precept J33 Forged Cavity Back iron set, you get a set of clubs forged from 1020 mild carbon steel with a progressive muscle back design. Forging clubs was the only way golf clubs were made (mass produced) from about the 1930s until the late 1970s -- before the advent of investment casting. Forging requires a lot of technical skill, expensive machinery, and the artistry and talent to finish each club to the exacting standards required for optimum performance. Starting with nothing more than a rough hunk of steel, the shape is gradually created by smashing the block of steel in progressively more club head like dies, or molds. To the untrained eye, a golf club is a golf club. But if you can recognize a forged club, you can see the care, attention to detail and -- dare I say -- affection that goes into each one. The greatest demand for forged irons comes from better players -- those who can tell the difference in feel and who also benefit from the enhanced ability to "work" the ball that a forged club allows. In the J33 irons, Bridgestone has engineered a variable head thickness and progressive Center of Gravity (CG) for enhanced feel and shot-making control. Bridgestone uses the acronym F.S.C. Design -- which stands for Forgiving long irons, Stable mid irons, and Controllable short irons. 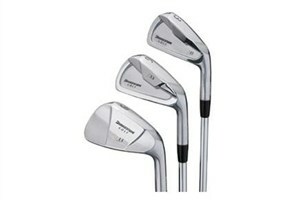 The progression of the set includes: 2-5 irons made with a forged cavity back and tungsten insert, 6-7 irons with a forged cavity back design, and 8-PW irons that are forged trapezoid muscle back irons. This progression of design makes the long irons easier to hit, the mid-irons with good workability, and the short irons with maximum feel. The J33 irons are fitted with the True Temper Dynamic Gold S300 shaft and Golf Pride Tour Velvet Grip, and are available in right hand only. If a forged iron is on your wish list, you might also consider the Mizuno MP58 or Tiger Woods Victory Red Forged irons by Nike.